Two rather unknown and unrelated pieces of legislation enacted last year without much fanfare create nearly unparallelled opportunities for the affluent to further literally enrich their decedents. The two pieces of legislation deal with raising how much money a person can annually convert into Roth IRA and raising Generation Skipping Transfer Tax exemption. The combination of these two rather seemingly unrelated pieces of legislation enables literally affluent grandparents to leave significant amount of money for their grandchildren free of taxes. Let us see how. Roth IRA is an individual retirement mechanism through which people can set aside certain amount of their after-tax income aside to be withdrawn later, with interest, free of taxes, subject to some restrictions and requirements. Roth IRA does not require individuals to start withdrawals at a certain age and the after tax dollars with interest are tax free, as opposed to 401K or traditional IRA. Last year, Congress lifted temporarily the $100,000 income restriction on individuals eligible for ROTH IRA. This means even Bill Gates could exploit Roth IRA, if he desires for some time. Hence, people could convert their wealthy 401K plans into Roth IRA regardless of how much they make, subject to paying income taxes upon conversion. In addition to lifting income tax requirements for Roth IRA, Congress also raised Generation Skipping Transfer Tax Exemption to $5 million from $1 million originally scheduled for this year. Very simply put, Generation Skipping Transfer Tax prevents transfer of taxes within each successive generation with the exception of spouses and children. The exemption up to the level provided provides a relief from such problem. 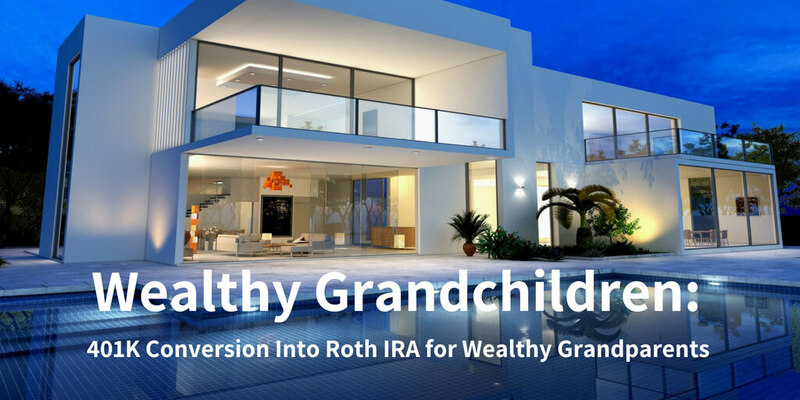 A very affluent individual converts $5 million of his 401K funds into a Roth IRA account and names the 10-year old grand child as beneficiary. This means the 10-year old receives the whole $5 million free of income tax or Generation Skipping Transfer Tax or gains tax. Nonetheless, the grandparent still has to pay about 35% tax on the conversion. One might conclude in the whole scheme of things, the $1.7 million, 35% of $5 million, for the affluent might be rather prudent and not as painful. In fact, such investment for the grand child could mean well over $100 million over the grand child’s expected long lifetime of 82 years or so. This is all money without any taxes. The caveat is the grandparents have to pay a rather huge but relatively not painful tax on the 401k conversion to Roth IRA. ‹ What Are The Perils of Hard Money Lenders?